Well, well, well. 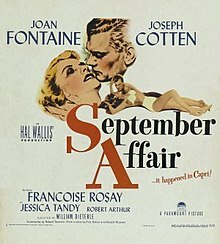 Another Joan Fontaine flick. I watched this the other night on Netflix, and before I go any further, a couple of notes. Yes, I found this searching “Joan Fontaine”. Yes, this is the earliest movie they have starring her on Netflix. Yes I’m currently in my 1-month free trial, and yes I’ll try to watch as many films as possible before the close of the month’s time. That and Breaking Bad. Damn, that’s a fine show. Anyways, where was I? Ah, yes. September Affair. Now it’s a supreme bummer that this movie was titled thusly. Let’s look at other similar movie titles. An Affair to Remember, Love Affair, Brief Encounter, XYZ Affair, The Thomas Crown Affair, well you get the picture. None of these ended well, especially the XYZ Affair, which drove John Adams out of office (not true). So it’s no surprise that I wanted September Affair to end differently. I mean, surely it couldn’t just be a film about an affair in September? September Affair begins in Rome, or Florence, or Naples, Capri or somewhere in Italy. I had trouble keeping track of the tourism plug that was the first act of the movie. We meet Joe Cotten, an unhappy married rich Manhattan-ite about to return back to New York to his unhappy family. But, the man is an engineer. So, I definitely fell for him. Hah, anywho, Joan plays Manina, not to be confused with soon-to-be-rebooted-played-by-Jessica-Biel-in-Total-Recall Melina. So Manina is a pianist and sort of free-spirit, and I took it as she was kind of just roped into this whole situation of meeting a married man on the flight back to America. So pretty simple stuff. They hit it off on the plane, but then there’s some engine trouble and the plane has to land in … Naples, I believe. So rather than wait for the delay to fix the plane, they both hitch a ride into town, sightseeing montage ensues, and they end up in this romantic Italian restaurant overlooking Naples. Pretty textbook seduction, Joe. They end up missing their flight (go figure), and then get this, EVERYONE DIES ON THE PLANE! Whammy. So rather than reflect on their mortality, they say “F it”, and start a new life together in Florence (I think). Problem is (well, there a ton of problems with this plan) they’re both legally presumed dead, and you can’t get by on your good looks, even in Italy. In a twisted, brilliant, never fully explained way, Joe pre-dates a check two days before the crash (illegal) to Manina’s piano teacher as charity (also illegal) and then the piano teacher gives the money back to Joe (more illegal). So, basically Joe swindles his still living wife and son out of money so he can pay for a luxury mansion/villa with Joan Fontaine. I mean, which isn’t to say I wouldn’t have done the same thing. The wife and kid come to visit. The affair falls apart. The end? Yeah, pretty much, except get this. Joan moves to South America at the end. What? Did I miss something? Maybe they’ve got a good piano scene down in Rio. Underrated Actors: meh, no one. This entry was posted on Monday, July 9th, 2012 at 12:08 am	and tagged with Joan Fontaine, Joseph Cotten and posted in Uncategorized. You can follow any responses to this entry through the RSS 2.0 feed.